Rid your compressed air or gas system of harmful oil aerosols, oil vapors, dirt, and pipe scale with Van Air Systems filter elements. 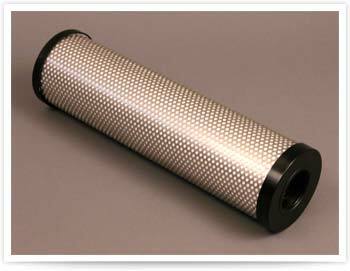 Van Air Systems is the original manufacturer of 10 grades of filter elements for particulate removal, oil aerosol coalescing, and vapor absorbing applications. Inner glass fiber pre-filter/support layer removes larger particles to extend element life and add support, preventing strain on the high efficiency media. High efficiency borosilicate glass fiber layer stops small particles and coalesces oil mists. Chemical-resistant polyester outer drain layer facilitates flow of coalesced oil to element bottom for draining and stands up to synthetic oils. Models 500 scfm and larger also include inner coil for extra strength. Chemical-resistant polyester pre-filter layer removes large particles, extending the life of the high efficiency media. Stainless steel inner and outer support cores provide superior strength and corrosion resistance, preventing rust particles from clogging the high efficiency media. Glass fiber support layer adds strength to prevent strain on the high-efficiency media. High efficiency borosilicate glass fiber media layer stops small particles from migrating downstream. Stainless inner helical coil (model 500 scfm and larger) gives maximum element strength for out-to-in flows. Medium efficiency borosilicate glass fiber layer removes submicron particles, extending the life of the high efficiency media. Activated carbon layer removes oil vapors and fine particles from the air or gas stream. Final borosilicate glass fiber filtration prevents carbon particles from migrating downstream. Inner glass fiber support layer gives carbon and final filtration layers added strength to prevent strain on media.